Posted on May 1, 2013 by Darren. Posted in News. The rewards for being in AKSamba don’t come any greater than when we experience a full-immersion course in the capable hands of an international master percussionist. This time it was Leon Patel from Manchester teaching drums, while Adriana Rosso from Brazil taught dance to a separate group. Providing pretty much the only reason you’d ever want to go to Wainuiomata (other than the second-hand record store), Sambanui was organised by our Wellington counterparts, Wellington Batucada. More than 70 drummers and 12 dancers from AKSamba, Wellington Batucada, Samba de Sol (Nelson), Tauranga Samba and Sambatron (Hamilton) made the pilgrimage. Accommodation wasn’t that flash (Brookfield Scout Camp), but the attendees were 5-star. When the drumming stopped, the socialising and partying began. 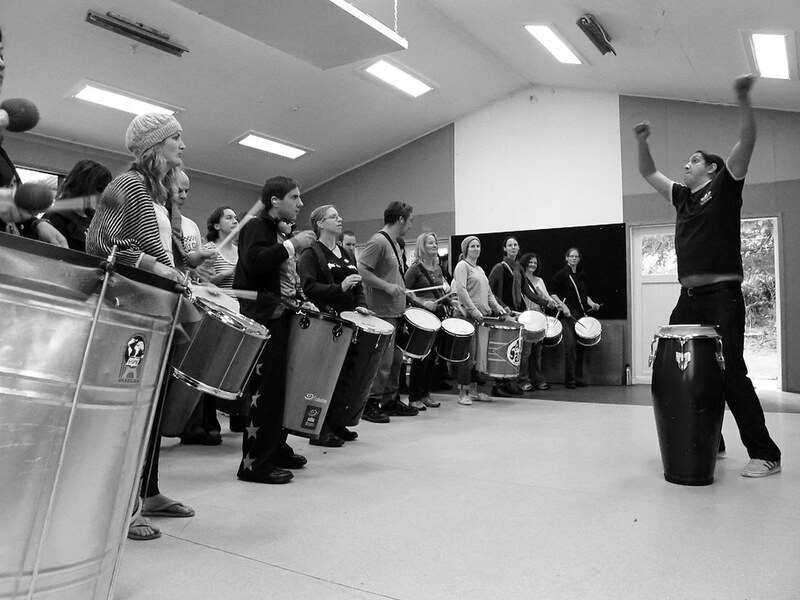 After four days, bodies aching, minds expanded, friendships strengthened and drumming skills honed, the AKSamba contingent returned to Auckland with new rhythms to perfect over winter. We look forward to seeing you at one of our gigs so that you can also feel the benefit that we felt by being part of what was a spectacular drumming adventure. There are no confirmed gigs at the moment. Check back soon! Missed out on our dance and drumming workshops in 2018? Follow us on Facebook for event updates, and sign up to the AKSamba Friends mailing list to receive email updates.